Anderson Software is proud to support the efforts behind “Handle With Care” initiatives that help traumatized children heal and thrive. The Handle With Care model facilitates school/community partnerships aimed at ensuring that children who are exposed to trauma in their home, school or community receive appropriate attention. Regardless of the source of trauma, the common thread for effective intervention is the school. Research now shows that trauma can undermine children's ability to learn, form relationships, and function appropriately in the classroom. HWC programs support children exposed to trauma and violence through improved communication and collaboration between law enforcement, schools and mental health services. What is P3 CareAlert? P3 CareAlert is a way for Law Enforcement and other First Responders to communicate with appropriate school administrators that a child may have been involved in a traumatic event. The details of the event are not important - as each Care Alert serves as a gentle, confidential notice to school administration that a child may need some extra attention. 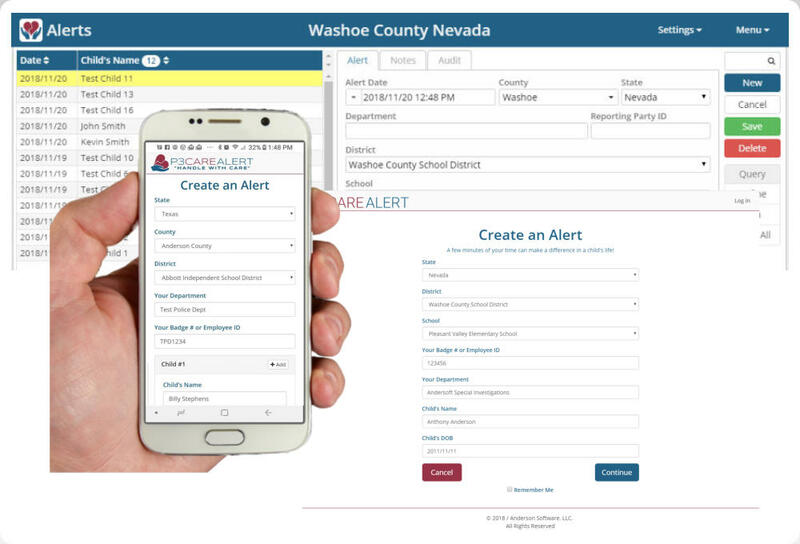 Law enforcement officers in the field can QUICKLY and EASILY submit “Care Alerts” to their partner schools. Accessible on both web and mobile browsers - the platform sends real-time alerts directly to school officials. Upon receipt of the Care Alerts - school officials simply “observe” the student for any unusual reactions or behaviors (acting out, shutting down, unusual absence). Observations may lead to intervention - based solely on school policy. P3 CareAlert Benefits: For Students: Provides the opportunity to support a child in the wake of traumatic events. For Teachers and Admins: Facilitates timely and appropriate care to vulnerable students. For Law Enforcement/EMS: Acknowledging that interactions can be traumatic is the first step in buffering the effects of crime and violence in a child’s life. Care Alerts facilitate proactive measures to prevent additional trauma. Licensing/Availability: The P3 CareAlert platform is available as an annual subscription - licensed for countywide or statewide deployment. Individual LEA’s and/or School District licenses are not available at this time. There are no limits to the number of users - nor the overall user activity within each account.